While random use of the Crea Cloni in Serie dialog can produce exquisite patterns, it is useful to understand the fundamentals of tessellation in order to have more control over the final design. An example of using the Crea Cloni in Serie dialog with a simple calligraphic stroke and the P6M symmetry group (see text). To construct a tiling, open up the Crea Cloni in Serie dialog (Modifica → Clona → Crea Cloni in Serie... ). The Crea Cloni in Serie dialog with no objects selected. 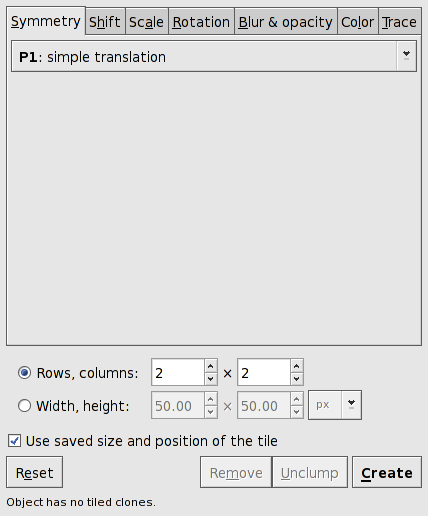 At the bottom of the dialog is a fixed section where you can choose the size of the tiling either by the number of rows and columns or by the width and height of the area you wish to cover. The terms Rows and Columns are only really appropriate for tiling of rectangular tiles (see below). Checking the «Used saved size and position of the tile» forces the tiling to use the size and position of the base tile at the last time the tile was used in a tiling. This preserves the spacing between tiles if the quadro delimitatore has changed due to editing the base tile. Clicking on the Reset button resets most of the entries under the tabs to their default values. The Remove button can be used to undo a tiling when the base tile is selected. The Unclump button can be used to spread out the clones in a somewhat random fashion (can be repeated). And, finally, the Create button creates the tiling. The simple tiling of a circle. The symmetry is "P1" and there are two rows and two columns. 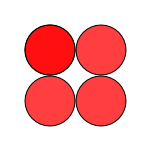 The circle has been replicated four times in two rows and two columns. The original circle is still there, under the top-left cloned circle. The quadro delimitatore of the circle has been used as the base tile size. This example is not so interesting, but there are many options under the dialog's tabs that can produce many interesting effects. Each tab will be covered in turn in the following sections.